Most people know that there are ways of harnessing the sun’s energy and have seen the large black squares of panels on people’s roofs. These are mostly photovoltaic (PV) cell producing electricity from the sun’s rays. They only work when its sunny and so their efficiency is a function of the number of sunny days and for how long the day lasts. In in the North East we have shorter days in the winter than the south of the country and also we tend to have more rain and hence cloud. 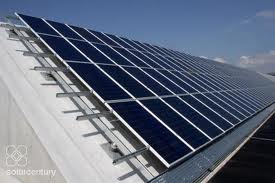 This all effects the efficiency of PV cells. However some very clever engineers have developed a way of using both the sun’s energy and the warmth from the external atmosphere to convert this into heat which can be used to heat your under floor systems and hot water cylinder. The system is generally termed “Thermodynamic Solar” and has become popular in areas where there is not a great deal of warm sunlight. It works on the same principle as a refrigerator but in reverse. A refrigerator takes heat from a space (where you keep your food), which cools it and dumps it out the back of your appliance. The warm air is dissipated to the air and is never seen again. With the Thermodynamic Solar system a fluid is passed through a heat exchanged which is located on the roof or external wall. The fluid is very cold and so collects heat from the atmosphere and turns it into warm water through a compression and heat exchanger process. It is this warm water that is used to heat your under floor heating or domestic hot water cylinder. The thermodynamic process has an energy efficiency of anything up to 400%, i.e. what is called a COP (coefficient of performance) ratio of 1:4 where 1 part of energy is put in to release 4 parts out. This is what makes the system so affordable. To be able to install the equipment the fitter needs to be F-Gas trained, this is a qualification that deals with managing fluorinated gases and ozone-depleting substances. Macoun are F-Gas approved. For more information from the manufacturers take a look at the Energie site and then contact us for details on how you can benefit from the power of the sun! Great post, just thought I would give my experience. 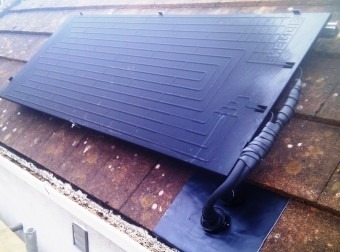 A few years back I fitted an electric underfloor heating kit in a small office at the end of the garden. It is not cheap to run but can be offset with a few solar panels 😉 When it came to doing the downstairs of the house we used a wet system as a friend of ours had electric underfloor fitted in her kitchen and after 6 months half the floor stopped working! With a wet system you don’t have that worry and is just as cheap to run as your old radiators.